Video courtesy of Catholic Television Network, Boston, MA. and you denounced the foolish Arius. The Mediterranean Sea port of Patara, Asia Minor (located in modern day Turkey), was the birthplace of St. Nicholas (c. 270 A.D.). In this bustling center of commerce the future saint’s youth was blessed with a caring father who, due to a successful textile business, was able to give Nicholas the rare advantages of a systematic education in language, higher mathematics, rhetoric and philosophy. Tragically, while still an adolescent, his devoutly Christian parents perished due to exposure to plague victims whom they had personally cared for. The adolescent subsequently became the sole heir to his father’s wealth. Overwhelmed by the enormity of the suffering he encountered in the wake of the disastrous epidemic that took his parents lives, Nicholas felt compelled to use his inheritance to provide relief to widows, the orphaned, the poor and marginalized who were pushed to the brink of despair. 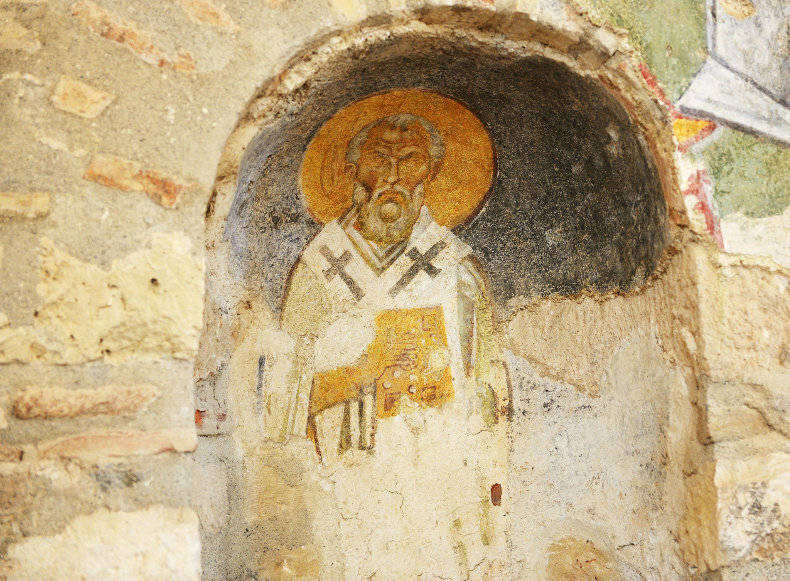 Fresco icon of St. Nicholas (above) as it is seen today in the St. Nicholas Church, Myra. His noble self-effacing compassion finds no greater expression than in the account of his providing three bags of gold coins, delivered under the cover of night, to save a widower and his three unmarried daughters from certain financial ruin. This singularly inspiring event is forever recalled each December with the anticipation of the arrival of the benevolent figure of St. Nicholas amid the darkness of winter nights. Under the cover of night,St. Nicholas (above icon, at left) anonymously tosses the first of three bags of gold coins through the open window of a destitute family. The poverty-stricken widower- father slumbers at the window. Meanwhile, his three adult daughters are heavy with asleep. The December tradition of this holy bishop’s midnight visitation is commemorated globally each year by countless cultures, in a variety of ways. The universal symbol of the stocking is readily seen, next to the old man. In truth, Nicholas vivifies our Lord’s admonition to those who wish to be His followers: “So when you give to the poor, do not sound a trumpet before you, as the hypocrites do in the synagogues and in the streets, so that they may be honored by men. Truly I say to you, they have their reward in full. But when you give to the poor, do not let your left hand know what your right hand is doing, so that your giving will be in secret; and your Father who sees what is done in secret will reward you.” (Mt. 6:2-4). View of the Sanctuary area within the Church of St. Nicholas, Myra (above). As a young man, Nicholas answered God’s invitation to enter the priesthood. Later on, word quickly spread that the Bishop of the nearby Diocese of Myra had died. Remarkably, particularly when one considers he was only 30 years of age at the time, a regional synod of bishops called upon him to fill the now-vacant See as the new bishop of Myra. 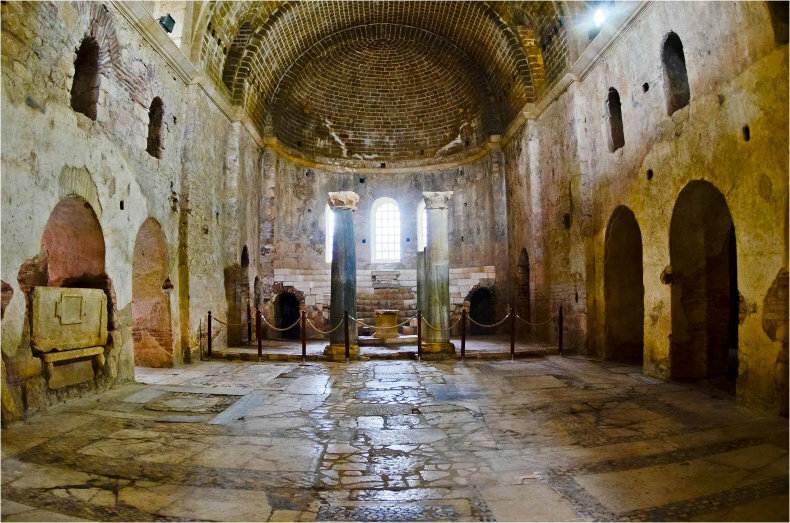 (Photos: Interior, Church of St. Nicholas, Myra, above; Ruins of Myra, below). Ruins of the Port City of Myra, Asia Minor (above), where Nicholas served as its Bishop. 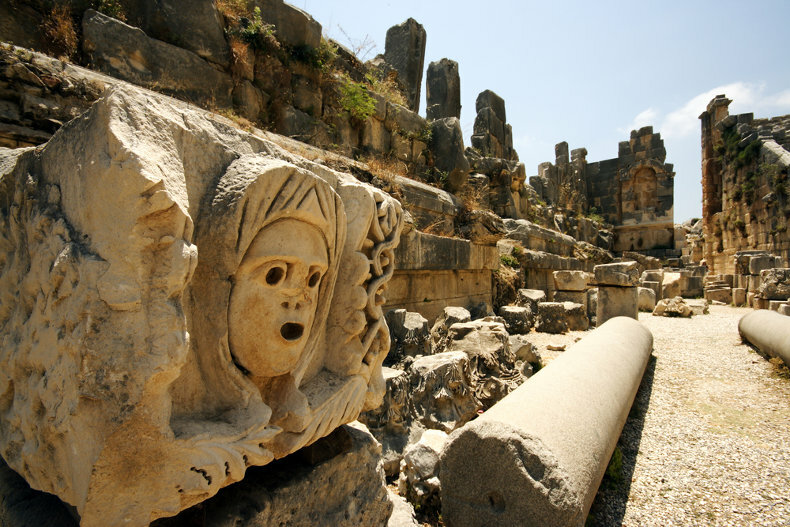 Close-up view of staging area artifacts still to be found in the amphitheater in Myra (below). Many traditions attesting to St. Nicholas’ extraordinary compassion holiness have come down to us throughout the ages. Additionally, numerous accounts tell of his prayers to the Lord delivering storm-tossed sailors and their passengers from almost certain death; thereby harkening to events recorded regarding a dangerous voyage experienced by St. Paul of Tarsus on his way to Rome (Acts 27:1-44). As Bishop, Nicholas was immediately imprisoned for the Faith during what would prove to be the bloodiest persecution of the early Church. This terrible incident began in February of 303 A.D., during the reign of the pagan Roman Emperor, Diocletian. History records that several edicts removed the legal rights of all Christians throughout the Roman Empire; including Asia Minor. These documents further demanded the worship of the pagan gods; something St. Nicholas flatly rejected. The persecution varied in intensity across the empire. 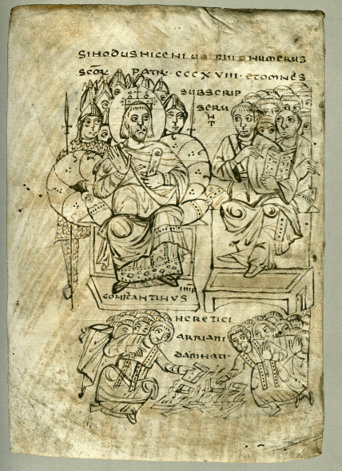 Persecutory laws were nullified under Constantine the Great with the promulgation of the now-famous Edict of Mila (313 A.D.). Historians mark this decree as the end of that persecution. 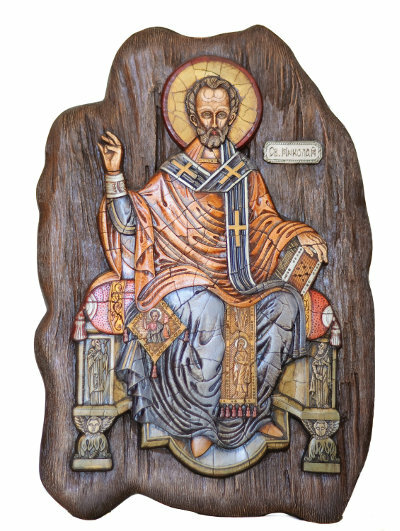 Twelve years after his release from prison, St. Nicholas was among the 318 bishops who participated in First Ecumenical Council of Nicaea in 325 A.D. 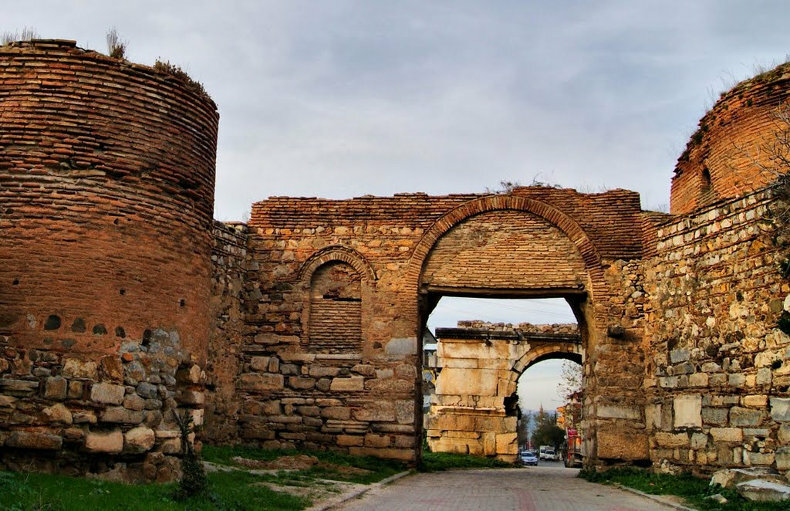 The council was called into session by Emperor Constantine to resolve doctrinal confusion that was actively spreading like an infection throughout the Roman Empire; the Arian Controversy. Nicaea, as it appears today. 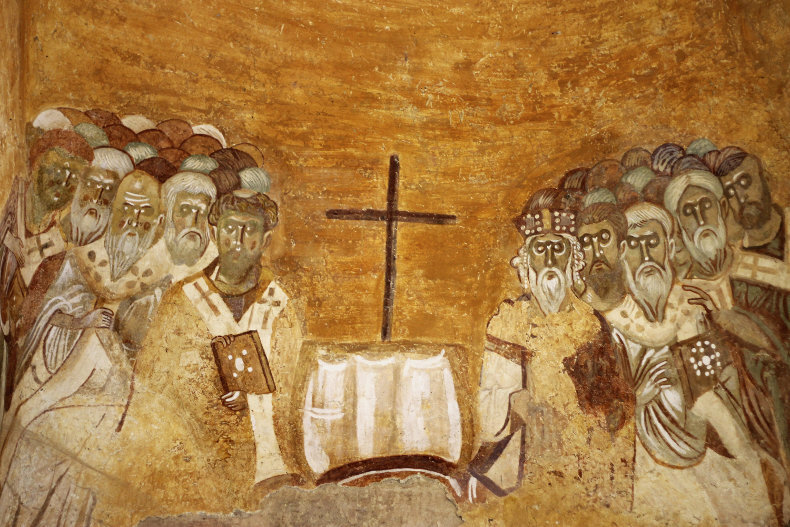 This is the site (above) where St. Nicholas attended the First Ecumenical Council in 325 A.D. Here Nicholas and the other 317 bishops of the world summarized the basic Articles of the Faith within the Nicene Creed. These critically important doctrinal truths include, among our Truths: the Incarnation of Jesus from the “handmaid of the Lord,” Mary of Nazareth; the Mystery of the Holy Trinity as being Three Divine Persons within One God and the Divinity of Christ as being Co-Eternal with the Father and the Holy Spirit. 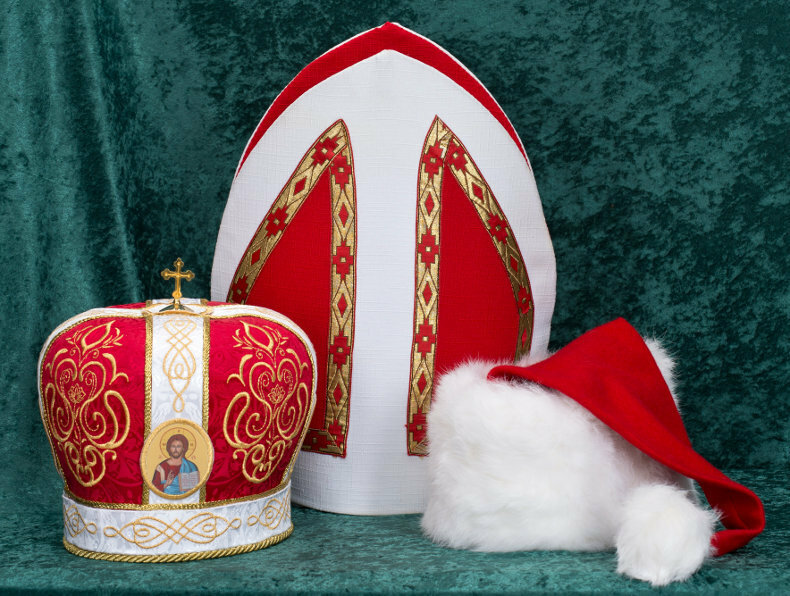 Although nothing of what St. Nicholas personally wrote down has survived, we do hear echoes of his own voice affirming what is now known as the “Nicene Creed.” That Creed provided the very first summary of the main Articles of the Faith that Catholic and Eastern Orthodox, as well as Anglican, Lutheran and other mainline Protestant Churches affirm to this day. 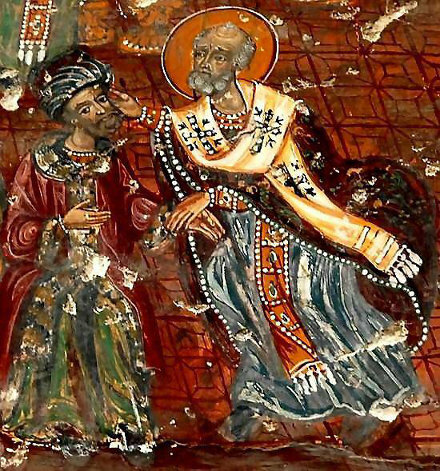 One of the most enduring traditional stories concerning St. Nicholas, recounts an incident which allegedly involved Bishop Nicholas and the notorious heretic, Arius, a priest of Alexandria. While the priest-scholar was making a formal presentation to the assembled 318 Council Fathers at Nicaea, he flatly denied the Divinity of Jesus Christ. In doing so, Arius at the same, of course, denied the existence of the Holy Trinity. 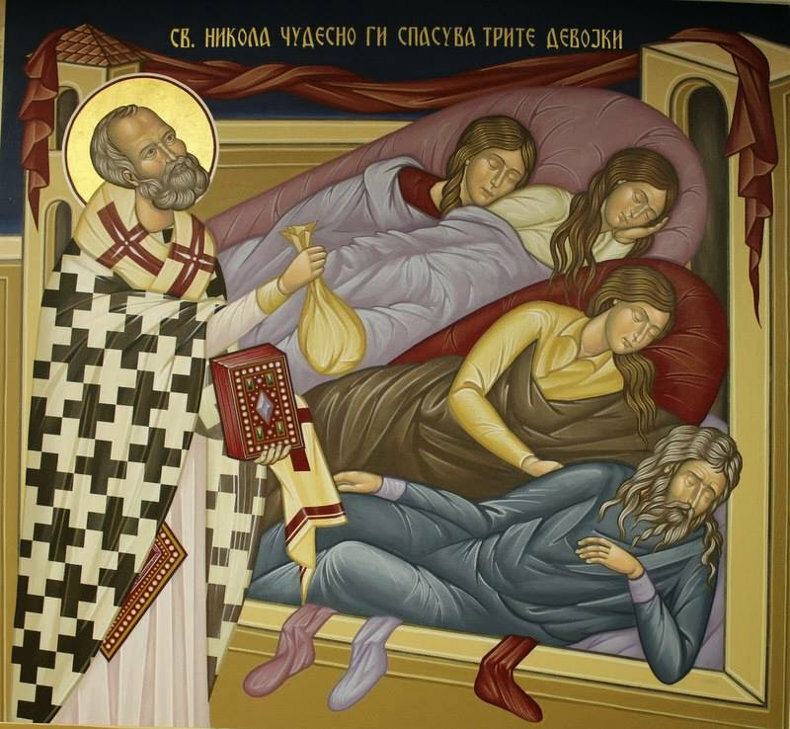 Upon hearing his words, according to the traditional story, Bishop Nicholas of Myra became so enraged that he walked up and slapped him across the face (see icon, below). As entertaining as this narrative is, there is simply no historical evidence to support the accuracy of the incident. Nonetheless, even legends like this do have a value. Whether or not it is ever proven a historically verifiable event, the above story does help us appreciate the seriousness with which the entire assembly of bishops (including Nicholas, himself) accepted the responsibility of safeguarding the Deposit of Faith. but nothing will be left even to remind anyone of him. and destroyed it by fire, his penalty shall be death. After many years of selfless dedication as Archbishop of Myra, tradition holds that Nicholas “Fell asleep in the Lord” in 345 A.D. at 75 years of age. In the years shortly after his death, it was noted that Nicholas’ tomb began to give off a sweet smell. Later, his bones were found to emit a mysterious liquid called “manna”. 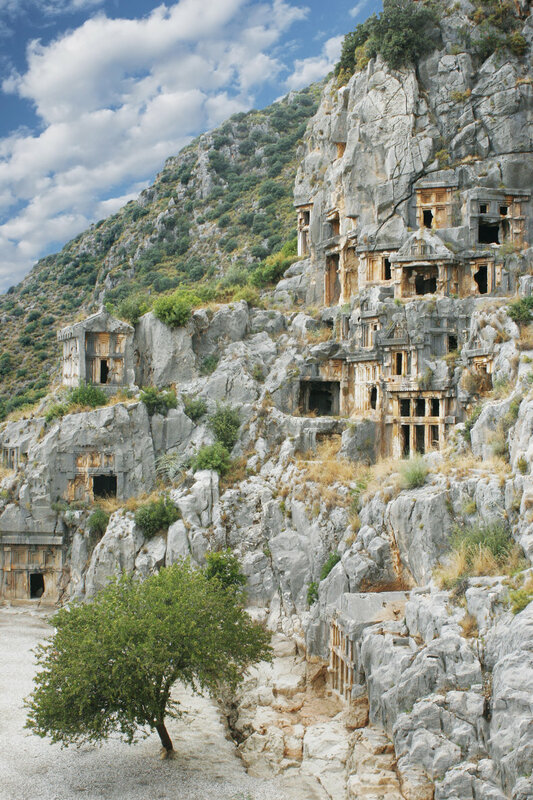 As the news spread, pilgrims from all across the Mediterranean flocked to Myra on pilgrimage. The saint’s body remained undisturbed for centuries within the walls of the Church of St. Nicholas, Myra. Eventually, however, sailors from Italy unceremoniously stole his bones and brought them to Bari on May 9, 1087. In time, a major basilica was erected in his honor. In 1089 A.D., just before the newly crafted limestone sarcophagus was sealed and consecrated, Pope Urban II placed Nicholas’ skull amid the saint’s other earthly remains. It would take yet another eight years before the entire Basilica edifice was completed and consecrated in 1197 A.D.
Today, the bones of St. Nicholas continue to produce the liquid, as it has for the past 17 centuries. Scientific tests have confirmed that the liquid is pure water. Every May 9th, the Feast of the Translation of the Relics of St. Nicholas, a Dominican priest withdraws the manna directly from the tomb of the saint. It is then mixed with- holy water and bottled in small, decorated glass vials for distribution to the faithful. In May of 1953, there was an inspection and scientific examination of the bones, when the tomb of St. Nicholas was opened for the first time since 1087. On that occasion, hundreds of photographs of the remnants were taken, and all of the saint’s remains were carefully cataloged. Scientific results demonstrate that the bones were those of a man, 5’6’ in height. His age was estimated between 75 and eighty years. It was noted that the skull of the man featured a severely broken nose. Pathologists indicate that the break was suffered many years before his death. Speculation admits the possibility that his nose may have been the result of harsh mistreatment during his lengthy imprisonment for his faith in Christ. 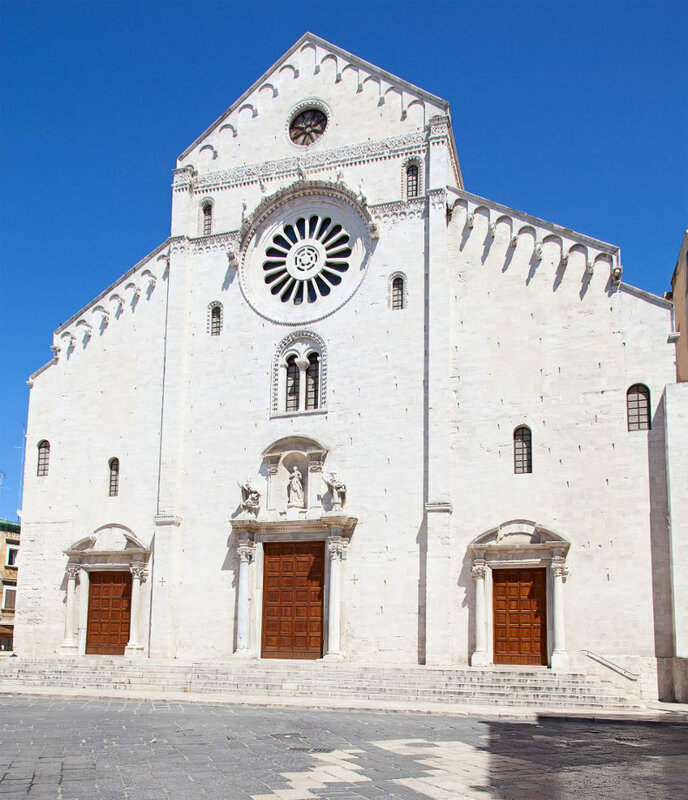 Basilica of St. Nicholas, Bari, Italy (above). The bones of St. Nicholas now rest in the underground crypt chapel of the basilica in Bari. The chapel itself was erected not long after the arrival of the saint’s remains from Myra in 1087 A.D. 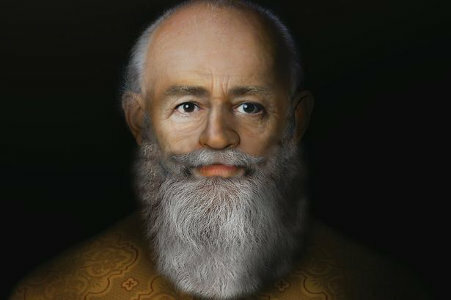 Although we now know that St. Nicholas died at an advanced age, Wilkinson used his actual skull to create a late middle-aged image of his face. 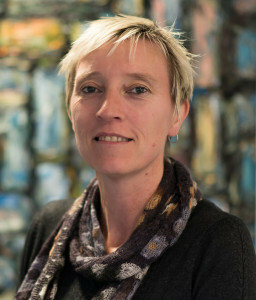 In the years following Professor Wilkinson’s original computer-generated creation of the “Real Face of Santa” (2004) while at the University of Manchester, she developed a far more sophisticated piece of imaging software at the University of Dundee and Liverpool John Moores University. Mindful of the dramatically improved research tools now at her disposal, she began to re-explore all data previous data that went into the 2004 face. Wilkinson believes it is safe to conclude that she has at long-last has faithfully captured the most accurate face possible. 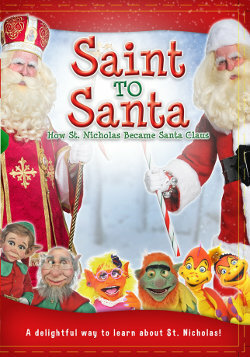 Want to Learn More About the REAL Santa Claus?